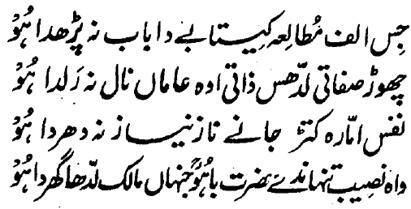 Hazrat Rahmatu-Allahe Ta-aala Alaihe says that those Seekers, who have once studied the Alif , they do not read the chapter of Baa . That is, Alif means the Name-Allah-the-Essence (Ism-e-Allah-Zaat) and the chapter of Baa means the rest of the Most Beautiful Names. That is, those blessed Seekers, who have got the flavor and bliss of the Name of the Essence, they do not pay attention to the Azkaar and Anwaar of the Calibers. Since the Arif of the Essence uses to be hardly one out of hundreds of thousands and Arifeen of Sifaat are numerous like common people, hence, the former is superior from the later. Without the Name-Allah-the-Essence (Ism-e-Allah-Zaat) and the Tawajuh of the Murshid-e-Kaamil, the Nafs-e-Ammara, which is sitting under the armpit like a black dog, does not become obedient and compliant through verbal Zikr and Fikr and the demur necessity of Riyazat but instead, it turns obedient and ineffective with the Order and Command of its Lord. Those people are very fortunate, for whom Allah Almighty is Lord of the Chamber. He, like the Sovereign of the quarters, makes the dog of Nafs obedient and silent by frightening and ordering it and enters the Seeker in His Chamber and makes him the Privy (and Insider) of the Secret. Some people just waste their time in battling through the Outwardly Zikr and Fikr, physical Worship and Riyazat with the dog of Satan and Nafs that are sitting in the doors of their hearts. Nafs does not become dominated and submissive in this way. The easy way of making it submissive and dominated is that one should meet Lord of the Chamber, that is, Allah Almighty, by becoming attentive towards Him. He will remove the dogs in His Door at once and call the Seeker inside the Sanctum of His quarters.